Fab with the trophy. She took the 4th place in that 100-km race. It was above 30 Celsius on that day in Lethbridge! Recently I’ve met with Fabienne, a vegan long-distance runner. We got to know each other about 5 months ago. 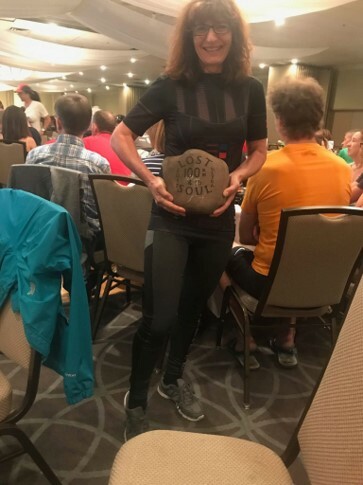 Fab tackled a 100-km race this September, in Lethbridge. She did exceptionally well. And she has been in a ultramarathon running for only 1.5 years! My guess is, one of the reasons behind her surprising results is the fact that she is vegetarian for 30 years, and vegan for the last 8-10 years. Moreover, in the last 2 weeks she had only raw living fruits and veggies on her plate, and that already shortened her recovery time! Her plan is to learn more about raw vegan foods (and I’ll be helping her with that) and have as much of them as possible before her next race in 6 months. About all this we talk in the video. Good video! Is that drujoks brother!? Thank you Feodora! Yes, I think it came out decent. This semi-human puppy (her name is Marley, 10 months) looks like Drujok’s little relative indeed 😉 but like Fab said she has some other blood in her, not only that of a poodle. I’ll tell Fab about your good wishes, thanks!